Simple, quick, and a quality drink for a tght budget, the Patrón pomegranate is best described as a simplified pomegranate margarita. It's quick to mix up—no shaking or blending required—and has a sweet, fruity taste that everyone's sure to love. The recipe from Patrón Tequila is beautiful in its simplicity and it requires just four ingredients that are easy to find. Since there are no fancy or exotic mixers to buy, you'll end up saving a little money, which can be put towards a quality tequila. In an old-fashioned glass filled with ice, pour the tequila and orange liqueur. Finish with a squeeze of lime juice. Ideally, fresh pomegranate juice would be best for this cocktail. However, the pomegranate is not the easiest fruit to get juice from—you need to mash the arils (seeds) then strain out the juice—it's not difficult, just somewhat tedious. Plus, it's a winter fruit with a relatively short season. The next best thing is to choose a quality bottled pomegranate juice. There are many options available that will let you enjoy the Patrón pomegranate year-round. As a substitute for Patrón Citrónge, choose another clear-colored orange liqueur. Triple sec and orange curaçao are excellent choices. Though the Patrón recipe recommends the brand's silver tequila, it is just as tasty with reposado tequila. That little bit of aging can add a nice depth to this simple drink. The recipe is also an easy one to transform into a big-batch cocktail so you can quench the thirsts of any number of guests. Simply increase the pours of each ingredient for the number of servings you need, pour it all into a pitcher with ice, and serve. How Strong Is a Patrón Pomegranate? The actual strength of your Patrón pomegranate cocktail is going to depend on how much juice you pour to fill the glass. At the recommended volume in the recipe, this drink comes out with an alcohol content right around 12 percent ABV (24 proof). It's light and refreshing and equivalent to drinking a glass of the average wine. 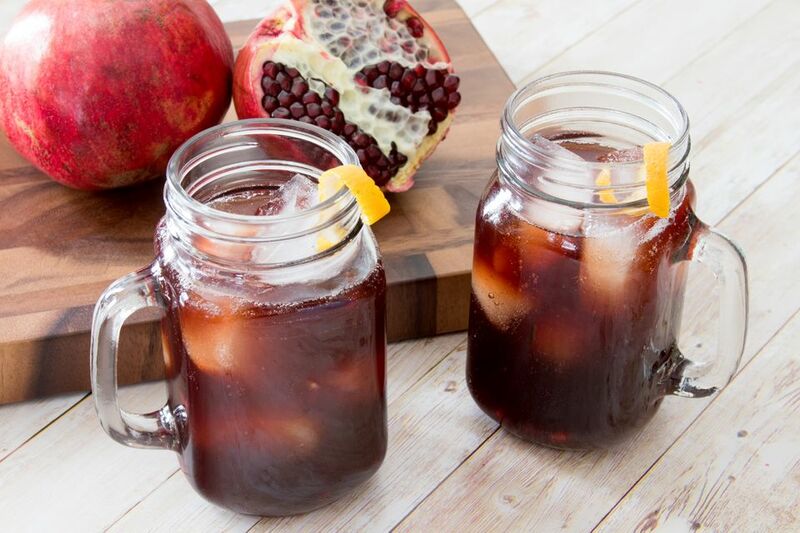 A cocktail called the pom padre (created by Ryan Kelley, the "Tequila Examiner") takes the tequila-pomegranate cocktail to a new level by adding extra flavors. The recipe uses 2 ounces of a blanco tequila, 1/2 ounce each of Bénédictine and Pama liqueurs, 1/4 ounce of Patrón Citrónge, and 1 ounce each of cranberry and pineapple juices. Shake it and serve the drink up in a cocktail glass.